A new series from Accion Press- Model Laboratory is devoted to one single model. 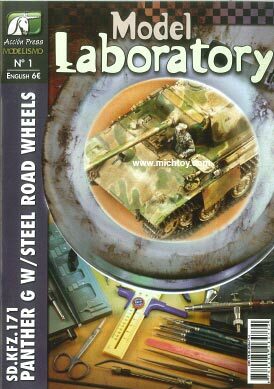 In this first issue the model choosen is a Panther Ausf. G with Steel Road Wheels. In an economical format but without losing the high quality of Accion Press publications, you will be shown how to build and paint a Panther. The article is complemented with a study of the avaliable products on the market to achieve your own model. Features a Sd.Kfz 171 Panther and shows an exhaustive step by step from the building to the painting. Also features profiles and a gallery with Panthers of several authors.